This paper was published in the open access journal Earth Surface Dynamics, and is available through the journal website and the MMU e-space repository. The paper is a combined effort from a large team of researchers interested in the way that organic carbon is exported from small tropical islands. These islands are very biologically productive, the forest grows quickly in the warm, wet climate. They are also responsible for delivering large amounts of sediment to the ocean. Rocks are weakened by earthquakes and then eroded by the frequent tropical storms that hit the islands. This washes sediment and carbon out to sea via two mechanisms. High sediment concentrations lead to ‘hyperpycnal’ plumes of material flowing along the ocean floor, lower sediment concentrations cause ‘hypopycnal’ flows that stay at the ocean surface. Both systems can spread sediments and carbon a long way offshore. It had long been thought that hyperpycnal delivery of sediment, which usually only occurs in the most extreme weather conditions when floods deliver vast amounts of sediment to the ocean in a short period of time, were efficient methods of organic carbon preservation. 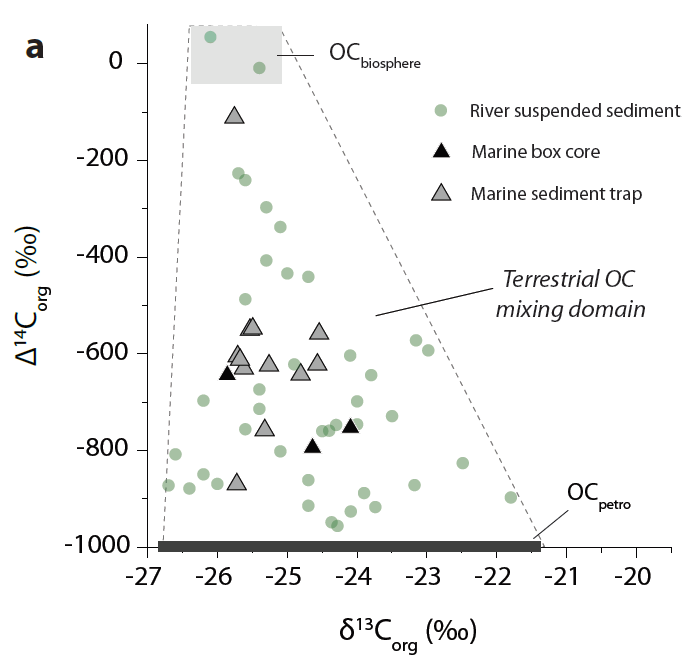 Our data confirmed this hypothesis, showing that little terrestrial organic carbon was lost during transport, and little marine carbon added to the mixture. However, the dataset also investigated how efficient hypopycnal delivery can be. Sediment and carbon are delivered throughout the year, in smaller floods and less extreme storms, and it had been suspected that this mechanism exposed the carbon to oxidising conditions where it could be degraded and released as CO2. We showed that in Taiwan, where hypopycnal conditions exist but are still receiving and accumulating a large amount of sediment, the burial efficiency of carbon in hypopycnal conditions is still very high. 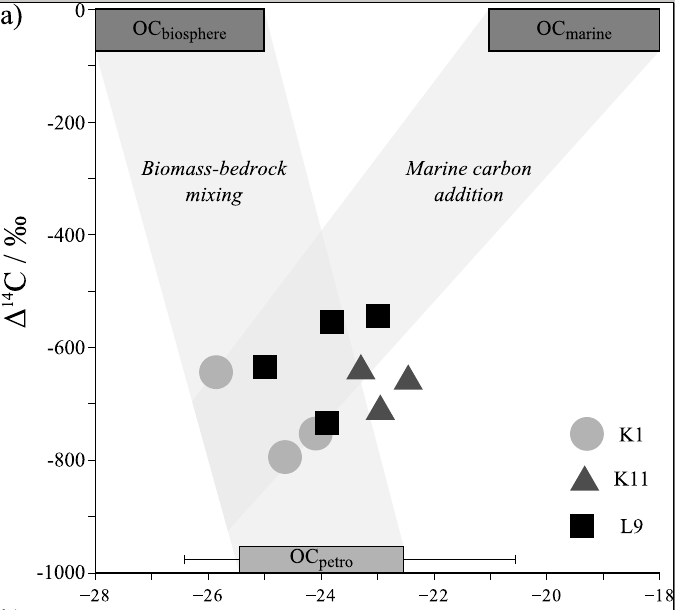 Marine carbon is mixed into the sediments, but at least 70% of the terrestrial carbon survives. This means that small tropical islands are even better at exporting and burying carbon than was previously thought, and therefore better at sequestering atmospheric CO2. We estimated that more than 8 Teragrams (million tonnes) of carbon could be buried each year throughout Oceania. This paper, led by Josh West and colleagues in Taiwan, was published in Limnology and Oceanography. The full text is available via the journal website, since all L&O papers become open access after three years, and through the MMU institutional repository. The island of Taiwan, in the South China Sea, has an interesting, yet devastating, combination of climate, biology and geology. It sits on the plate boundary between Eurasia and the Phillipines, which are moving into each other and causing the island to rise out of the ocean. This leads to earthquakes as the land is pushed up, and rapid erosion as the mountains get steeper and taller. The mountain sides collapse as landslides, producing sediment that is prone to being washed away by Taiwan’s many rivers. These rivers may not be the longest in the world, but they carry a lot of water, because Taiwan sits in the tropical zone where the year-round high levels of rainfall are topped up by several typhoons each year. The final piece of this jigsaw is the biology – being in a warm, wet region means that Taiwan is very biologically productive, with extremely fast forest growth rates. Coupling all of these features together leads to a heavily forested mountainous island on which the hillsides are regularly landsliding and generating woody debris (tree trunks, branches, shrubs etc.) The large typhoons that hit the island each year provide water which washes the woody debris into the rivers and then out to the ocean. In 2009, Taiwan was struck by a particularly devastating tropical cyclone, Typhoon Morakot. The island received about 4 metres of rainfall in just a couple of days, enough to cause rivers to burst their banks, washing away entire villages and unfortunately leading to several deaths. I visited the island a few months later, and the clear-up operation was still going on. Beside the rivers was up to a metre of chaotic sediment with tree branches sticking out of it, since the waters had carried everything off the hillside and dumped it when the floods receded. A lot of the tree trunks made it all the way through the river, out to the sea. They washed up on the shoreline around Taiwan, and were reported as far away as Japan. These trees contain a lot of carbon, which has been moved from the hillside to the floodplain and out to the sea. Our study tried to work out just how much carbon, in the form of coarse woody debris, was being transported during this storm. Single river channels, such as the picture above, could contain 40 million tonnes of carbon – how much carbon was washed away by the whole storm? The second method used reservoirs as sampling facilities. Reservoirs have filters to stop large trees going through their exit pipelines, and so any woody debris reaching the reservoir will be stopped at the dam (see the top picture for an extreme example). Knowing the area of land that drains into the reservoir, and the amount of wood trapped at the dam, you can scale up to the area of the entire river catchment. Both of these methods produced similar results, they agreed that there was a shocking amount of carbon washed to the ocean during the storm. 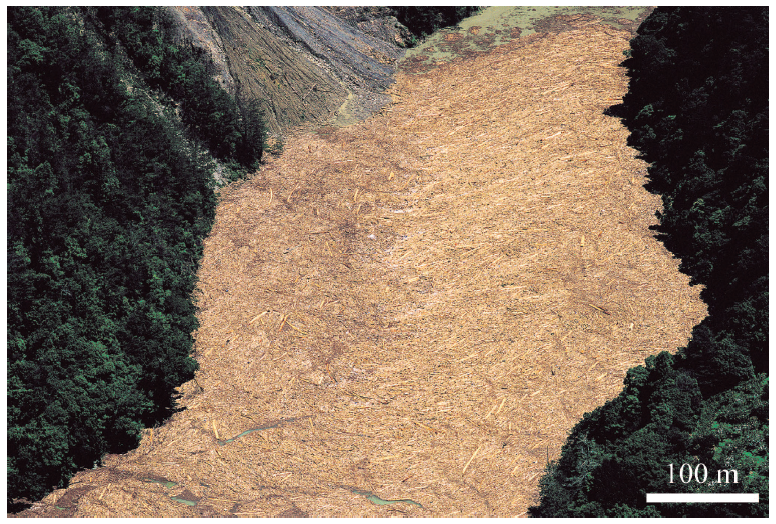 The storm delivered 3.8 – 8.4 Teragrams of woody debris from Taiwan to the ocean, which represents 1.8 – 4.0 Teragrams of carbon. This is about 1/4 the annual delivery of carbon from the Amazon River, but most of that is as small particles. The woody debris delivery in these few days was over 10 times greater than the annual woody debris delivery from the Amazon. So one single event on a small island was significant from a global point of view, but how much carbon is a Teragram? One Teragram is equal to one million tonnes; an oil tanker can carry 300 000 tonnes of oil (mostly carbon) and therefore the storm delivered 10 oil tankers worth of carbon to the ocean. Obviously this event is not as disastrous as an oil tanker spill – the woody material will rot down and provide food for ocean-living creatures as well as potentially being buried safely in the sediments. Our paper shows just how much carbon can be washed away by a single storm, and highlights that large pieces of woody debris, too large to analyse by most techniques, are an important and probably under-studied element of the organic carbon cycle. I have recently had a paper accepted in the journal “Marine Geology“, which looks the transport of organic carbon during a major typhoon in Taiwan: “Redistribution of multi-phase particulate organic carbon in a marine shelf and canyon system during an exceptional river flood: Effects of Typhoon Morakot on the Gaoping River–Canyon system”. Typhoon Morakot was a particularly severe tropical cyclone that hit the island in 2009, causing flooding, mudslides and hundreds of deaths. From an organic geochemistry perspective, it also transported sediment and organic carbon from the hillsides and floodplains out to the South China Sea. Some of this carbon was “fresh” material, coming from trees, grass, shrubs and soil. Other parts of the carbon was “fossil” carbon, sourced from the mountains running down the centre of the island, or from sedimentary rocks in the foothills and floodplains. It is important for the global carbon cycle to understand how much of the land-sourced (terrestrial) carbon makes it to the ocean floor, because this process can lead to carbon being stored in the sediments for millions of years. Out at sea, all of this organic carbon and sediment was mixed together with material produced in the water column, by algae and plankton. Mixing three carbon sources together makes it very difficult to work out how much of each one is present in a sample, which is where my work comes in. By combining measurements of the nitrogen to carbon ratio with the carbon-13 to carbon-12 isotope ratio, these three inputs can be identified. I did this for samples collected in the Gaoping Canyon, a deep submarine channel running from the island out to the deep sea. I found that terrestrial organic carbon was the dominant form of carbon present in the canyon and that therefore millions of tonnes of carbon were transported to and buried in the ocean by the typhoon. This carbon will most likely be locked away in these sediments for thousands or millions of years, while on the island more trees will grow to replace the ones washed away in the storm. In the process, carbon dioxide will be taken out of the atmosphere, so the storm-flood-burial cycle should go some way towards slowing the rate of climate change. If you would like to download the paper, it is available freely via open access or as a PDF. The first paper produced directly from my PhD research was published last month in the journal Applied Spectroscopy. Automated Analysis of Carbon in Powdered Geological and Environmental Samples by Raman Spectroscopy describes a method I developed for collecting and analysing Raman Spectroscopy data, along with Niels Hovius, Albert Galy, Vasant Kumar and James Liu. I will discuss Raman Spectroscopy in depth in a future post on this site, but the short version is that Raman allows me to determine the crystal structure of pieces of carbon within my samples. A river or marine sediment sample can be sourced from multiple areas, and mixed together during transport. Trying to work out where a sample was sourced from can prove very difficult. However, these source areas often contain carbon of different crystalline states; if I can identify the carbon particles within a sample then the sources of that sample, even if they have been mixed together, can be worked out. The challenge in this procedure is that there can be lots of carbon particles within a sample, and each one might be subtly different. To properly identify each mixed sample, lots of data is required, which can laborious to process. My paper describes how lots of spectra can be collected efficiently from a powdered sediment sample. By flattening the powder between glass slides and scanning the sample methodically under the microscope, around ten high-quality spectra can be collected in an hour, meaning five to ten samples can be analysed in a day. Powdered samples are much easier to study than raw, unground, sediment, and I have shown that the grinding process does not interfere with the structure of the carbon particles, therefore it is a valid processing technique. Once the data has been collected, I have devised a method for automatically processing the collected spectrum using a computer, which removes the time-consuming task of identifying and measuring each peak by hand. The peaks that carbon particles produce when analysed by Raman Spectroscopy have been calibrated by other workers to the maximum temperature that the rock experienced, and this allows me to classify each carbon particle into different groupings. These can then be used to compare various samples, characterise the source material and then spot it in the mixed samples. Delegating as much analysis as possible to a computer ensures that each sample is treated the same, with no bias on the part of the operator, and also cuts down the time required to process each sample, which means that more material can be studied. The computer script used to analyse the samples is freely available and therefore other researchers can apply this to their data, enabling a direct comparison with any samples that I have worked on. This technique will hopefully prove useful to more than just my work in the future, and anyone interested in using it is welcome to contact me. While the paper discusses my application of the technique to Taiwanese sediments, I have already been using it to study Arctic Ocean material as well. The paper itself is available from the journal via a subscription, and is also deposited along with the computer script in the University of Manchester’s open access library.